Manco .NET Licensing System allows you encryption of the key application data and/or source code with cryptographic keys different from ones that are used to encrypt/decrypt license file. 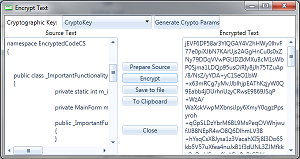 Then cryptographic keys are included into the license file as custom values. You can include encrypted data and/or source code into your project and then decrypt, compile and load them into memory in runtime using functionality provided by Manco.Licensing.License class. After that this compiled code can be used in the application or control. This approach make your application more strong against hackers’ attack. 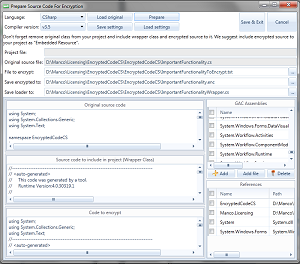 License Manager also provides functionality to prepare source code for encryption. Manual preparation of the source code for encryption takes a time. Debugging of the encrypted code using Visual Studio or other IDE seems to be impossible. How to optimize this process? License Manager provides functionality for automatic preparation code for encryption. It creates calling interface, wrapper class and code for encryption for existing class. This allows you design, implement and debug your class in a regular manner and encrypt it in a few minutes just before issue a product. Not only text information can be encrypted but binary code and data can be encrypted as well. Using Manco .NET Licensing System you can encrypt ready to use assemblies (DLLs) and load it at runtime using functionality provided by protection library.